Farmingdale's 5th annual district-wide Pink Out Day was held on Friday, October 12, 2018 followed by 2nd Pink Out Foootball game on Friday, October 26, 2018. The initiative, championed by Mia Smith, an 8th grader in Howitt Middle School raised money for the Breast Cancer Researh Foundation by selling hot pink shirts throughout the district, collecting spare and loose change and raffling off gift baskets. 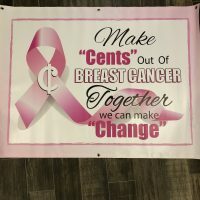 Her Make "Cents" Out Of Breast Cancer-Together we can make "Change" is in her 5th year. All students, faculty and administrators wore their pink shirts to show support for those affected by breast cancer. Mia began her fundraiser in 2014, in the 4th grade, when her mom was diagnosed with stage 3 breast cancer. Watching her mom go through treatment inspired Mia to be active to help with research, awarness and to one day help be the end of breast cancer.